Adobe’s Creative Cloud just got more creative and less cloudy. 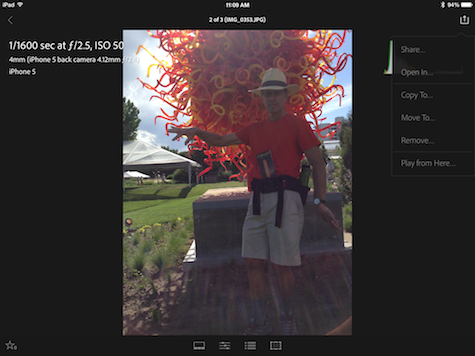 You can perform all essential image edits on an iPad easily on photos from the iOS Camera Roll, Photo Stream, and other sources. Everything begins with Collections. Each one can have any title you want, and they can be sorted via four different criteria: Import Date, Title, Size, and Status. There is no limit to how many images can be in any collection. A check box confirms that all photos in a collection have been downloaded both locally and onto your Creative Cloud account that is accessible on many devices. 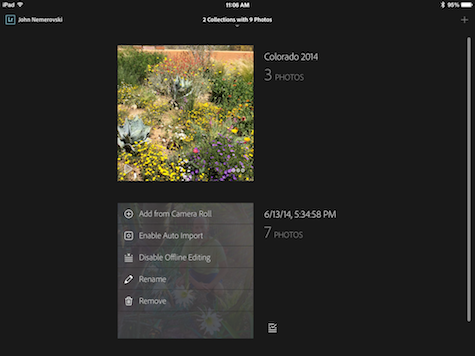 iOS Lightroom mobile can automatically import new photos taken from your iPhone, or manually import Camera Roll images. 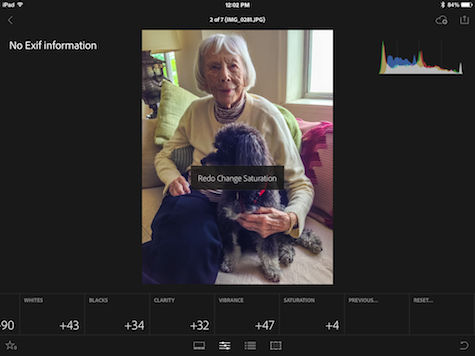 Photos taken on an iPhone will sync to an iPad and to the computer version of Lightroom, via the user’s Creative Cloud account. 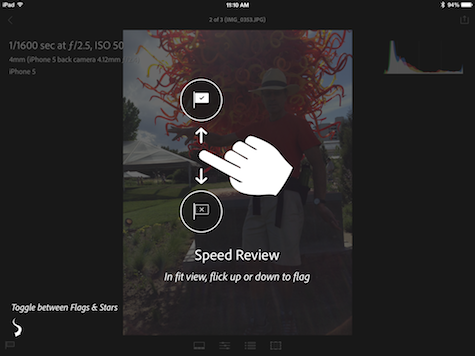 Certain iPad finger gestures can be used when working with Collections. Occasionally you will see an overlay of gesture suggestions and tips that are activated when tapping the screen with two fingers, and toggled the same way. Tapping on the three dot symbol lower right in any collection master thumbnail gives you five options: Add from Camera Roll, Enable Auto Import, Disable Offline Editing, Rename, and Remove. When you navigate to an individual photo via swiping and tapping, metadata is shown upper left and a color histogram is upper right on the iPad’s display. Tapping the share/action symbol far upper right provides six possible operations: Share, Open In, Copy To, Move To, Remove, and Play from Here. Several of these activities have multiple options. All of the above is basic to the main event, which is editing your photos using Lightroom mobile iPad iOS app (abbreviated here as LRm). The four symbols below the image are used to activate LRm’s powerful editing tools. The first symbol lower left center is a viewer for thumbnail images below the primary picture being altered. The fourth symbol lower right center opens the aspect ration selector to assist with preset crops plus other size and composition decisions. You will want to spend time playing around with all the possibilities in this feature family. The third symbol from the left, lower-center, activates five families of preset alterations: Creative, Color, B&W, Detail, and Effect. Each preset contains several different tappable, fixed image changes. 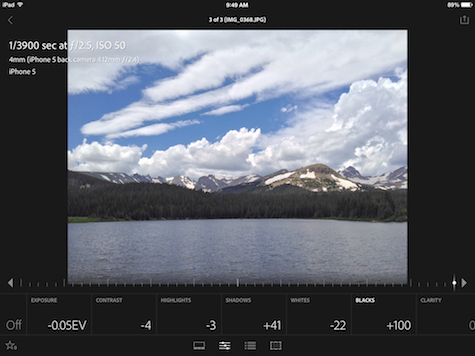 In most other photo editing apps, whether iOS or computer OS, such one trick fixes are generally not helpful, and they tend to be gimmicky. LRm’s 42 total preset edits contain some very useful alterations for both color and grayscale conversions, especially when editing on a mobile platform. 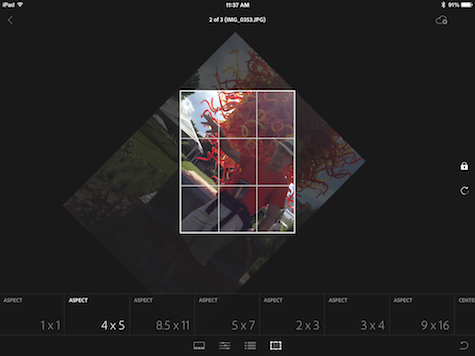 Up to this point in our introduction to LRm on the iPad, we are commenting on more robust versions of what can be done to images in many other competing iOS apps. 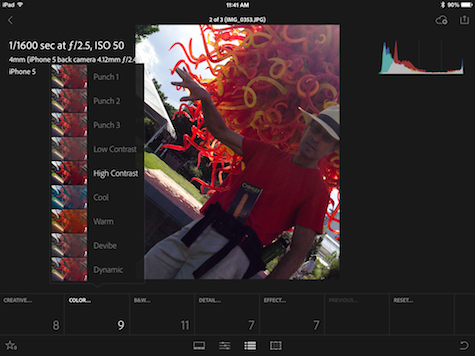 The most important bonus in LRm that is worth the modest monthly subscription fee for Adobe’s photo-based Creative Cloud software is the family of lighting-based editing tools. They are opened by tapping on the symbol second from left, lower-center. The feature names and sliders will be familiar to all experienced photo software users, and newcomers will learn quickly how these excellent tools work: White Balance, Temperature, Tint, Auto Tone, Exposure, Contrast, Highlights, Shadows, Whites, Blacks, Clarity, Vibrance, and Saturation. All the lighting and other LRm edits are non destructive, so when you wreck the photo of your dear mother you can revert to the original and begin afresh as needed. Here is my mother with our little black dog in a photo with horrible highlights, shadows, and mid-tones. After trying different slider variations, in less than two minutes I have an improved version worth saving and printing for her photo album. Undo and Redo symbols assist, far lower right, to help decide if previous edits are worth keeping. I just returned from vacation to Colorado. 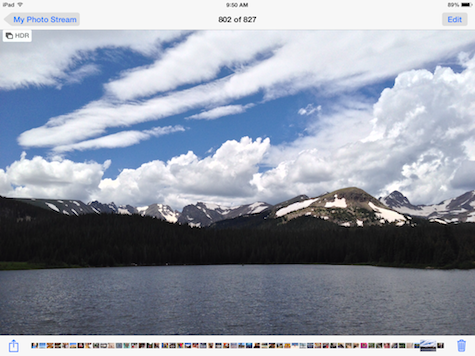 My most successful LRm-enhanced photo was taken in subdued lighting at Brainard Lake using my iPhone 5. Here is the original. The sky and mountains are dramatic, but the line of trees is a dark mess and the lake is dull and uninteresting. Here is the much better version, including LRm’s numerical values for the finger-slide changes I made in a couple of minutes. The trees have detail, and they support the primary composition of mountains and sky. The lake has gorgeous definition, and appears to be shimmering in the uneven reflections. That endless moaning sound you hear in the background is coming from non-believers and people in denial about Adobe’s progressive decision to charge subscription fees for using its photo software, instead of only having packaged physical products. Get over it, chumps. For the cost of one sandwich and a drink every month, you can participate in the ongoing revolution of Photoshop and Lightroom Creative Cloud and mobile apps that remain the best in the world. What you don’t hear is the quiet acclaim of hundreds of thousands of photographers who are paid subscribers and who are pleased with what Adobe offers for 33 cents per day. 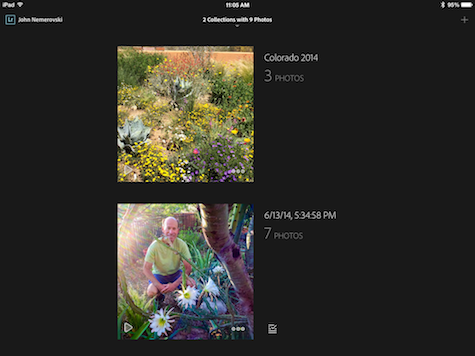 Lightroom mobile is new, exciting, and loaded with features. 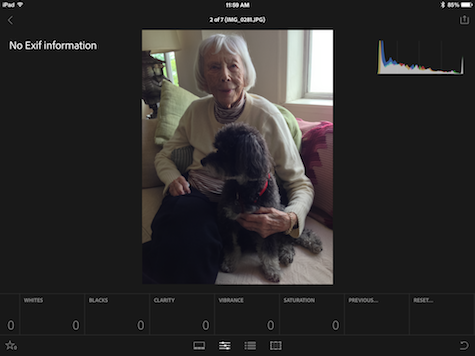 Using it satisfies my creative goals for much of my iPad photo editing, and my mother certainly is happy with her improved photo album. Try LRm free for 30 days and let me know how you like using it. Awesome review! I’m downloading this as we speak to check it out!